When I heard the news that Jewish American comedienne Joan Rivers had died, I recalled the images of a passing moment I had with her in the mid 1980′s when I was on a coast-to-coast public speaking tour of America to promote the message of my book ARAFAT Terrorist or Peacemaker? For a few moments I feared that I was going to be the cause of her death from a heart attack. I had just left a radio studio in San Francisco after an hour long interview (with adverts every few minutes, of course) in which I had been allowed to explain that Arafat had prepared the ground on his side for peace on terms which any rational government in Israel would accept with relief. I was on my way out of the building through a long corridor in which two people could just about pass each other without touching. Joan Rivers, the next guest on the show, was approaching, protected by three aggressive looking minders. Joan Rivers stopped, shrieked, buried her head in her hands and seemed to be choking. Her legs also seemed to be close to buckling. One of her three minders pushed me away and against the wall and the other two propelled her towards the studio. No words were exchanged but if looks could kill I would have been killed. It was on that tour of America that I was made completely aware of how the Zionist lobby works to make to make life as difficult as possible for truth-tellers if it fails by bullying and/or blackmail to persuade radio stations not to give them air time. The usual practise of many American call-in radio shows is to trail their guests a week in advance. This is meant to give listeners who are interested in a particular topic or issue time to think about a question to ask they might like to ask. It also gives the Zionist lobby time to get organized. For the second hour, which the Zionist lobby had not anticipated and could not fill with its own verbal hit men and women, every single call was from open-minded Americans who wanted to hear what I had to say and ask me sensible questions. That didn’t surprise me because when I arrived in America at the start of the tour an FBI officer requested a meeting with me. He wanted to me know that the most dangerous terrorist organization in the U.S. was the Jewish Defence League (JDL). And he gave me two pieces of advice. The first was that I should never hire a self-drive car, always go by taxi. (The obvious implication, stated, was that if I was driving myself about a bomb could be placed under the car). The second was that if I stayed more than two days in a hotel in any major city I should never return to it at night if I was walking by the same the same route. In 2010 Joan Rivers tweeted a joke about her death. “With all the plastic surgery I’ve had, I’m worried when I die God won’t recognise me.” If she was still alive today, I would say to her something like, “If he does recognise you, perhaps you should worry about whether he will forgive you for saying that because they voted for Hamas the Palestinians of the Gaza Strip prison camp deserved what they were getting when Israel was delivering them more death and destruction. Unfortunately, we've seen what happened to George Galloway a few days ago and heard the deafening silence of all busy bees in the Palace of Westminster. Also, it was not that long ago that we've heard of the tragic consequences of rambling in the Scottish Highlands or becoming suicidal in a wood in Oxfordshire! I'm sorry to be pedantic but I don't understand the footnote. I literally don't understand it. Could you clarify what you are saying there please? Otherwise I love the article. The more Joan Rivers tried to preserve her youthful looks the uglier she got (a kind of Doreen Grey); much like the more America tries to maintain the myth, the more mythical it appears to be. Even if I never learned but one thing in all my years of traversing thru this life I have learned to not believe everything I've read, or been told. There might be a ting of truth hidden in there somewhere, but first, you must find it where it is hidden behind a bunch of 'inconsequential ' that are thrown in to confuse or to mislead. Half-truths are no more acceptable than are half-lies. After 'following Alan Harts` ''offerings' for so long now, I am inclined to trust him in wherever he leads. He will tell it exactly the way it is... whatever the peril his Truths entails...and he makes sure ,first off, that he checks thoroughly , his offerings...For he Believes in the Whole truth, not just part of it. Everyone should be Thankful we do still have a man like Mr. Hart believes in searching out the FACTS . How many others can we depend on to 'tell it like it is', no matter where it leads him ? Thank you, Mr. Hart...We are in dire need of more Truth-sayers than is readily found. Most are hiding behind a cloud of dust. Too many who should be on the forefront of truth are too afraid of the consequences. God be with you, Mr. A.Hart..And Be protected by God at all Times. Arafat was not a man who 'played it safe with words all the time, but he was never afraid of presenting the Truth ( Wherever it was found.) This is exactly why he is no longer with us. The truth is a danger to some who have much to hide. I am interested but not at all surprised how Joan Rivers reacted to the picture of Yasser Arafat on the cover of Alan's book. Doubtlessly she was conditioned by those around her. It was a reaction of instilled fear, instilled by those who seek to control. Those who are fearful of the truth can be made to think of speak of and do terrible things to others to maintain a lie. Such is that of these Zionists, and of the JDL of who the FBI warned Alan of (from whom the threats on Alan's life may plausibly have come from) and the so called Radical Islam Zionism has spawned. As we see it is easy to incite people to hate and kill an innocent other. Last year, Joan Rivers (Russian Jewish Joan Alexandra Molinsky), refused to apologize for making joke about the Holocaust on her TV show “Fashion Police”, insisting that was just part of her Jewish humor to remind the public about Holocaust. Rivers' “antisemitic” joke involved a dress worn by German supermodel Heidi Klum during Monday’s Oscars episode of her show, saying: “The last time a German looked this hot was when they were pushing Jews into the ovens“. The joke made Israel lobbyist Abraham Foxman jump on his seat. 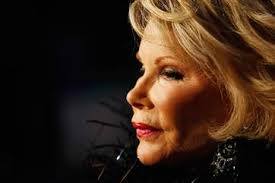 He slammed Joan Rivers with a statement, saying: “Of all people, Joan Rivers should know better. This remark is so vulgar and offensive to Jews and Holocaust survivors, and indeed to all Americans, that we cannot believe it made it to the airwaves“. So the Guru is telling us that all 300 million Americans are Jewish! After learning that Joan River is no Hillary Clinton, Abe Foxman, wrote a letter to Suzanne Kolb, President of E! Entertainment Television, urging the network to prevail upon Ms. Rivers to issue a formal apology, and to remove the segment from future broadcast. A similar request made by Abe Foxman in the past, have resulted in Rivers' telling Foxman’s organization ADL to, “shut the f-ck up”.